St. Giles has 22 peal boards, the earliest dating from 1891 and the most recent from 2007. The majority of the boards, however, date from the 1920s and 1930s. Ambrose Osborne rang in nearly every peal during this era, often with one or more of Leonard or Horace (his sons) or Wilfred (no relation) Osborne. Ambrose Osborne was clearly a prolific ringer, and he conducted a number of the peals. He is also on a number of boards at St. Mary and St. Laurence. The methods rung in these early peals are largely unremarkable – Plain Bob, Grandsire and Stedman – except for two peals of Superlative Surprise Major. The first of these, in 1900, would probably represent something of a technical challenge, and was the first peal of surprise ever rung in Reading. The band for this seems to have been drawn from all three Reading towers. The conductor was Frank Hopgood, another notable local ringer, judging by peal boards at the three towers. After 1933, there are no peal boards until 1977, when a peal was rung for Queen Elizabeth’s Silver Jubilee. There are only two further boards in the following 25 years until the peal in 2002 which celebrates the Queen’s Golden Jubilee. 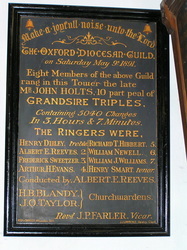 A new board celebrating the 100th peal on the bells (2007) has been added to the collection. A number of the peal boards from the early twentieth century are highly decorated, a style not common in modern peal boards. The earliest three peal boards bear the legends “Make a joyful noise unto the Lord”, “Glory to God in the Highest” and “Praise Him Upon the Well-Tuned Cymbals”. The ornate border to the 1911 peal of Superlative is most unusual. It is initialled A.W.P. in the bottom right-hand corner, presumably Arthur Pike who had rung the fifth to the peal. 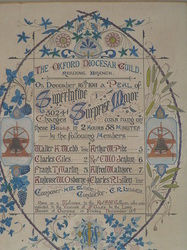 He is also responsible for a slightly less ornate decoration on the board for the 1916 peal of Stedman Triples, although he didn’t ring in that peal. 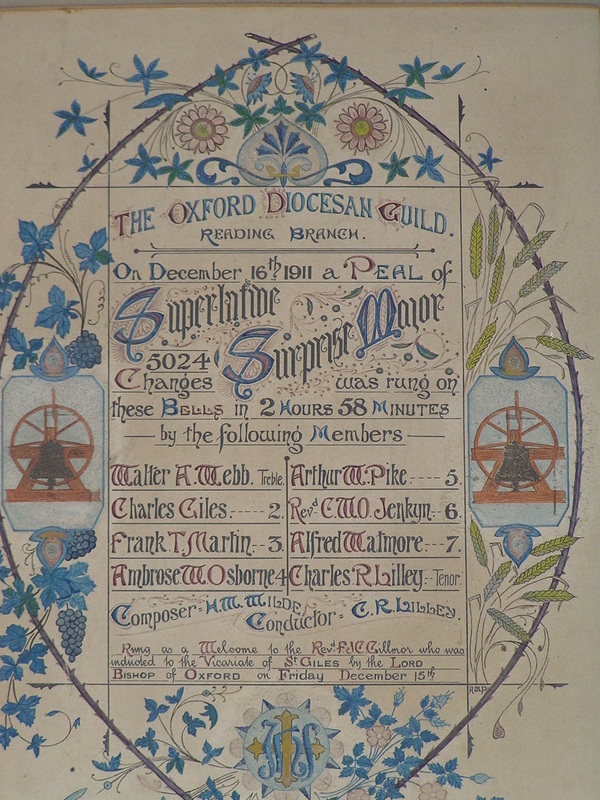 All the peals commemorated on boards were rung for the Oxford Diocesan Guild, often with the addition of one or both of the “St. Giles Society” or “Reading Branch”. In addition to the peal boards, there is a stone memorial dated 1787. The bells are currently rung from a platform at the foot of the tower, approximately 5m from the ground. However, this was not always the case and so in 1787 the memorial would have been quite high up the tower wall. 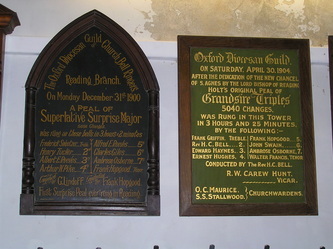 There are two Oxford Guild notices, one marking St. Giles’ membership of the Guild and another older board with a selection of prayers for use in the tower. 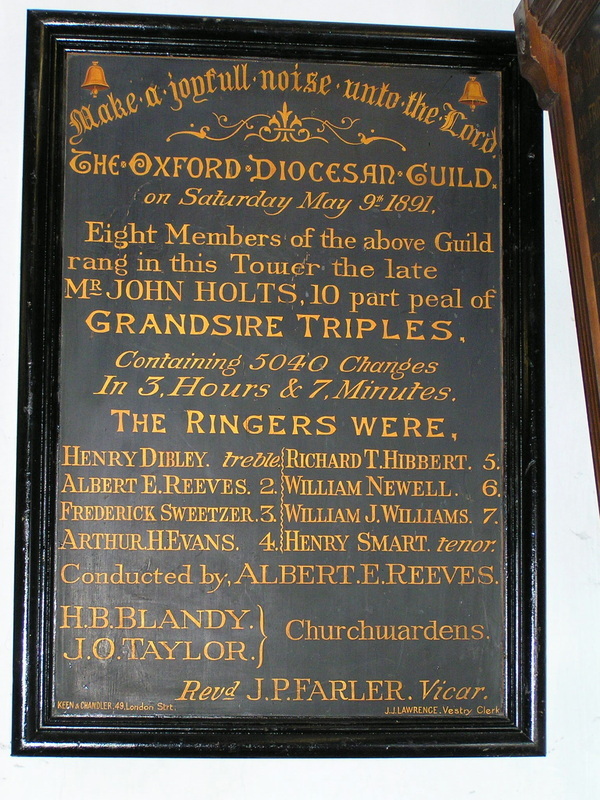 A third notice details the weights of the bells at the end of the nineteenth century. 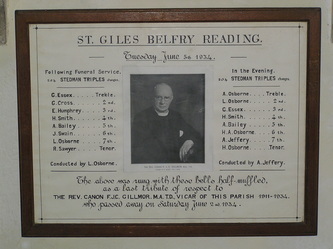 The final notice commemorates ringing in 1934 as a mark of respect at the funeral of Rev. Canon F.J.C. 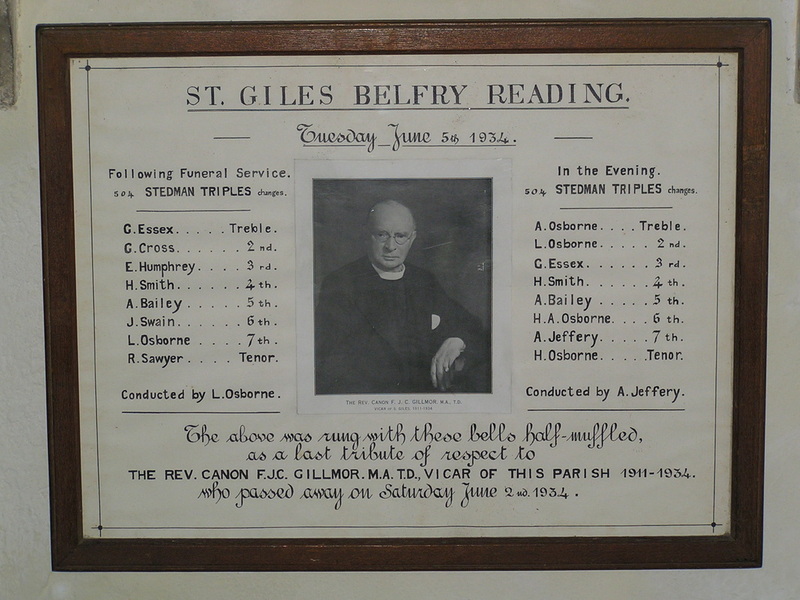 Gillmor, who had been vicar of St. Giles since 1911. Two touches of Stedman Triples, each approximately fifteen minutes long, were rung. The board includes a photograph of Canon Gillmor.